Temperature : Maximum of 29°C ; Minimum of 21°C. A lesser known hill station, Nersa is in the forest range of Londa in the Western Ghats in Belgaum district, of Karnataka State. It shares its boundary with Goa state. 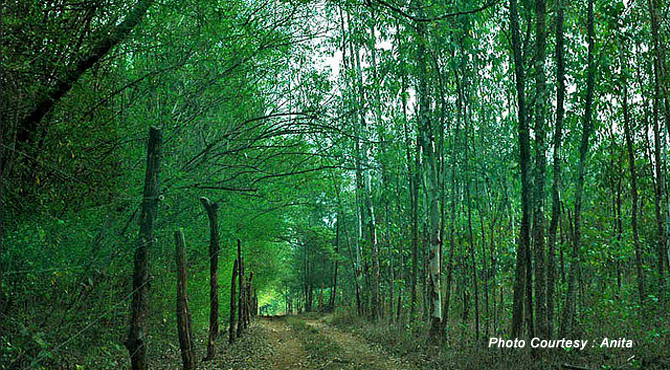 A part of the proposed Bhimgarh Sanctuary, it covers a rich and agricultural area. Nersa has thick trees abound. Nandi, Mathi, Kindal Rosewood, Harda, Jamba found here. The terrain varies from undulating countryside to steep rocky. The forests in Nersa has around 174 varieties of medicinal plants. Nestled in the thick forests of Mahadayi valley, it is a perfect holiday destination for a wildlife enthusiast and a bird lover. Nersa, also offers lots of thrilling experience. The hills, rocks and valleys provide a lot of adventure tourism. Places that can be reached on foot in the Nersa area are Bhimgad, Kongla, Jamgoan, Abnali, banks of the Bandora and Sagarhole Rivers and Dongargoan. But some areas required more physical fitness than others. While trekking, one can enjoy spectacular views of the surrounding areas as well as hundreds of bird and butterfly species reptiles and mammals. Chose the length of your trek, half or full day. Costs depends on the length Charges depend on the length of trek and the area selected. Bird watching is another tourist activity carried out in Nersa. More than 276 species of birds have made this part of the Western Ghats as their home. The forests at Nersa attracts bats, the incredible mammal that are found in the woods. It is supposed that more than 40 species of bats are seen in Nersa. Deep inside the Londa Forest Range, at Talevadi, there are 200 bats in Barapedi cave a laterite cave. Known as Wroughton's Free Tailed Bats, these rare bats are small and eat only insects. They take their name from Wroughton, the British officer who discovered them in the early 1900s. Beyong Talevadi lies an area called Krishnapur, home to a rare species of bats called Theobald’s Tomb bat. More than 20,000 bats are found in this area. They have been living in a three tiered cave for eons. Eventhough a less explored area, Mahadai Valley is wonderful picnic spot at Nersa. Considered as one of the richest reservoirs of biodiversity in the world, one can find numerous birds, plant, animals and endangered bat species.